Companies with a paid-up share capital of Rs. 5 crore or more are legally obliged to appoint a whole-time Company Secretary who must be a member of the Institute of Company Secretaries of India. Every Company having a paid-up Share Capital of Rs.10 Lakhs or more but less than Rs.5 Crores is required to engage the services of a Company Secretary in whole time Practice for issue of Compliance Certificate. All Companies seeking listing on Stock Exchange are required to appoint a whole time Company Secretary. Due Diligence and Corp. Compliance Mgt. 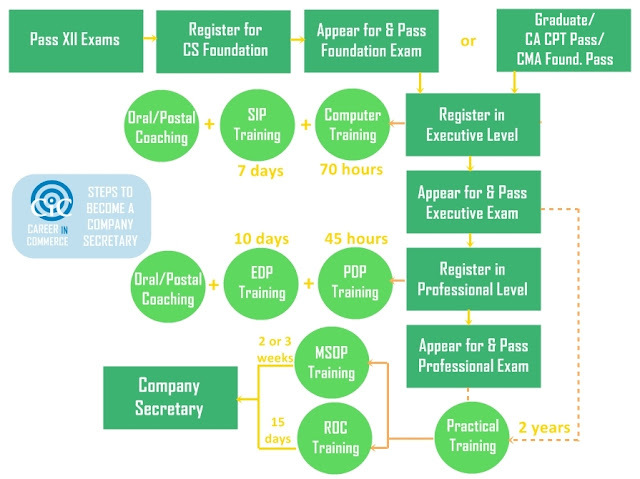 ICSI-CCGRT has launched a full-time Integrated Company Secretary Course. To view the Examination Time Table for the June 2014 session, click here. To view the results of the December 2013 session exams, click here.